Located in the east of the country, Belfast is Northern Ireland’s capital. It is a vibrant, international city with a population that was just over 330,000 at the last census. Belfast is now a popular destination for relocation, study and weekend breaks with its historical and modern cultural scenes. Located in the east of the country, Belfast is Northern Ireland’s capital. It is a vibrant, international city with a population that was just over 330,000 at the last census. Although the city’s reputation and economic development suffered greatly during the Troubles, particularly in the 1970s, the Good Friday Agreement (signed in 1998) resulted in substantial regeneration, investment, economic growth and an influx of tourists and students to the city. Belfast’s phenomenal economic growth includes an upsurge in the housing market: according to figures from the Ulster University House Price Index, prices in Northern Ireland increased by over 6% in 2016. The average house price in Belfast is currently just over £153,000 (Zoopla). The boom in the housing market has been citywide with apartments faring particularly well, indicating the ongoing potential for investment opportunities in the city. Indeed, there have been a number of major developments in areas in and around Belfast, which have helped to drive the buy-to-let sector. 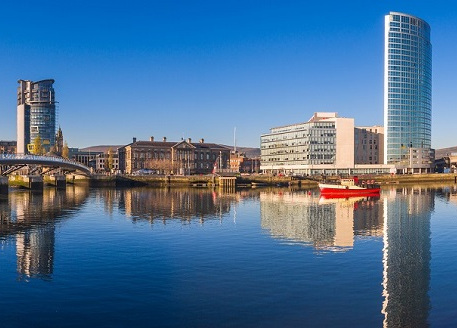 With two prestigious universities in the city – Queen’s University (or Queen’s) and the Belfast campus of Ulster University – there is increasing demand for quality student housing in the city. There are also a number of university colleges (including St Mary’s) and higher education colleges, all with a high demand for accommodation. Belfast has incredible transport links, including two airports. Belfast International Airport is located just over 13 miles northwest of the city and is the largest airport in Northern Ireland. The smaller George Best Belfast City Airport, which is just 3 miles from the city centre and opened in 1983, has a single runway that serves domestic and international flights. City Airport has helped to boost the economy in terms of greater accessibility to major European capitals and easy access to the city for tourists and businesspeople. Belfast is now a popular destination for relocation, study and weekend breaks with its historical and modern cultural scene that includes architectural highlights such as the Obel Tower (a mixed-use office and apartment space, which is the tallest building in Ireland), The Royal Courts of Justice, and the vibrant Waterfront – the city’s entertainment and conference centre. Belfast has also built up a world-renowned culinary reputation, which includes two Michelin star restaurants (OX and Deanes Eipic). Traditional and modern eateries, pubs and bars have created a diverse food scene that attracts visitors specifically to sample the exceptional work of talented chefs that are championing Irish ingredients while pushing the boundaries of creative food.